The term "Gbe" is also used more narrowly to describe a subgroup of this cluster. Ewe is a national and regional language in Ghana and Togo. Mina is a lingua franca with about one million speakers in Togo and Benin. 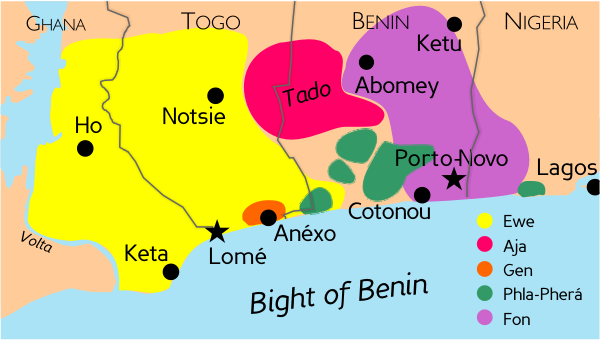 Fon is a regional language in Benin. (Fon in Benin) Language of wider communication. Vigorous. Limited oral use in administration, spoken use in education, religious services, commerce, and labor. Positive language attitude. ... Newspapers. Radio programs. TV. (Mina/Gen) Language of wider communication in Togo and Benin. Gen is one of the languages used for adult literacy by the Benin government and one of the six with government post-literacy programs. (Aja in Benin) The government selected Aja as one of the six national languages for post literacy. Gbe languages are written using some extended characters; diacritics are used to mark tone in at least some cases. A tilde (~) indicates a nasal. Ewe is a tonal language with four tones: a rising tone marked by an acute accent (é), a falling tone marked by a grave accent (è), a falling-rising tone marked by a caron accent (ě), and a rising-falling accent marked by circumflex accent (ê). However the tones are not always marked. Some keyboard layouts at http://www.bisharat.net/A12N/Projects are intended to cover these languages. There is(was? a group in Benin interested in localising OpenOffice in Fon. This is a complex group of languages/dialects with varying degrees of intercomprehensibility and apparently a fair amount of multilingual/multidialectal skill among speakers. Probably separate localisations would be necessary for software. It is not known the extent to which versions in these related languages might benefit from collaboration and whether harmonisation of terminologies would be possible or useful. Hartell, Rhonda L., ed. (1993), The Alphabets of Africa. Dakar: UNESCO and SIL. (The French edition, published the same year, is entitled Alphabets de Langues Africaines).